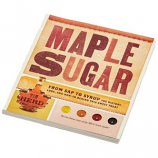 INCLUDES INFORMATION ON THE HISTORY OF MAPLE SYRUP HOW TO IDENTIFY AND TAPE TREES HOW TO TURN. CLEAR SAP INTO SYRUP AND RECIPES. COLORFUL PICTURES AND EASY TO FOLLOW INSTRUCTIONS. FEATURING RITE IN THE RAIN WEATHER PROOF PAPER. 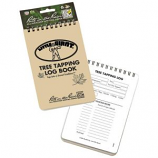 INCLUDES INFORMATION ON HOW TO IDENTIFY A MAPLE TREE PLUS PAGES TO RECORD WEATHER CONDITIONS. AMOUNT OF SAP COLLECTED ETC.. MADE IN THE USA. .